According to the company's website (via The Verge), the long-delayed titanium RED Hydrogen One has started shipping today. If you pre-ordered a unit back in 2017, the phone will be shipped to you for free as a peace offering from the manufacturer. Others will have to pay $1,595 to order the phone directly from RED's website. This will be the second free Hydrogen One model received by those who pre-ordered the Titanium unit; last year, to placate those waiting for the top-of-the-line Hydrogen One they reserved, the company sent them the cheaper aluminum variant at no charge. The Hydrogen One is known for its 5.7-inch QHD (1440 x 2560) "4-view" holographic LCD display. This allows certain content to be viewed in 3D ("beyond 3D" says RED's website) without special glasses. Powering the phone is the two-generations-old Snapdragon 835 Mobile Platform. The phone is equipped with 6GB of memory, and the Titanium model features 256GB of storage. RED, known for its professional digital movie cameras, equipped the Hydrogen One with a pair of 12.3MP cameras in back, and a pair of 8.3MP cameras in front. Users can take stereoscopic images from either side of the phone, and portraits can be snapped with the all-important blurred background bokeh effect. A higher than average capacity battery is required to power up a screen like the one on the Hydrogen One, which explains the 4500mAh battery found inside the unit. Even though the titanium model is just now shipping, remember this is not a new phone per se, which is why Android 8.1 Oreo is pre-installed. At $1,595, you're getting past Samsung Galaxy S10 5G territory and closing in on the $1,980 Galaxy Fold. 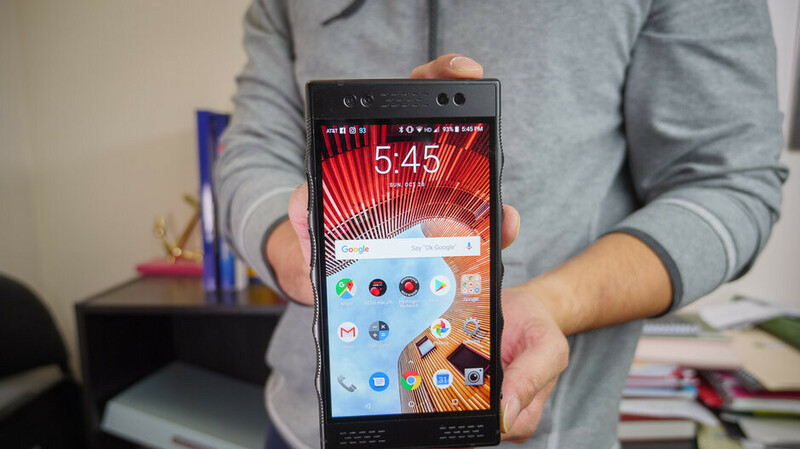 Even the price of the aluminum version, $1,295, seems steep for a phone that attempts to do something that other manufacturers have tried before (remember the HTC EVO 3D and the LG Optimus 3D/Thrill 4G?). Still, if money is no object, you can now order the Hydrogen One in titanium directly from RED. Or, you can sniff around on eBay and other such sites to see if any of the freebies being sent out by RED are being converted into cash. You might be able to find a good deal this way. LMAO. This phone wouldn't be worth the price of admission if it was rocking the 855 and here it is with an 835. GTFO. They couldn't even update the specs?